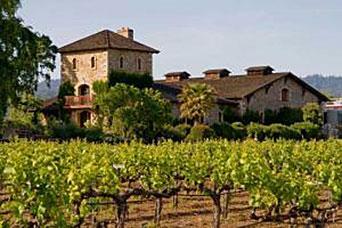 Travelers headed to Napa Valley will find a wide range of lodging options. As one of the most-visited wine country regions, it's not surprising hotel options can range from more affordable motels to very posh five-star luxurious resorts. If budget is a primary concern in your lodging search, be mindful of peak times, like fall harvest, when rates can be at their highest. Located in the city of Napa itself, Chardonnay Lodge is a mid-range motel-style property that offers casual yet classy accommodations a stone's throw from wineries, restaurants, shopping, and more. TripAdvisor reviewers like its convenient location and charming atmosphere. Each of the 19 rooms features a king or Queen size bed, cable TV, microwave and mini-fridge. Chardonnay Lodge has a very strict no pet policy, so if you're traveling with pets, you will want to look at other options nearby. There is no restaurant on-site but you are a short walk or drive to many of Napa's best eateries. Rates at Chardonnay Lodge can range from $110 a night for a queen bed up to $200 for a Jacuzzi suite on a weeknight in spring. A fall weekend can start at $180 for a queen and up to $290 for the Jacuzzi suite. Beazley House is a gorgeous little dog-friendly B&B in downtown Napa. The suites are cozy and a few even offer Jacuzzi tubs. It's located in a revitalized historic district, just two blocks from the 'West End.' Aside from its convenience to many of the city's fine dining establishments, like Morimoto Napa and Cole's Chop House, the Beazley House also hosts wine tastings in the evenings (check for schedule). It's important to note that, because they have a license to serve wine and beer, they are prohibited from hosting anyone under 21 years of age. Each of the rooms is individually decorated and offers a different ambiance, so book far in advance to secure your favorite one. 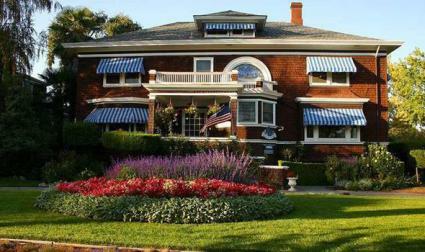 The house is a 1902 mansion and rooms inside the house have king beds with 52,000 thread-count microfiber sheets. Rooms in the adjoining Carriage House offer more private romantic hideaways. Each of the five rooms here have king begs and in-room two person spa tubs. Breakfasts are a real treat at the Beazley House. Meals are typically low-fat and heart-healthy. They always include fresh organic eggs, seasonal fresh fruit, homemade granola, hot entrée, cheeses and organic yogurt, toast, muffins, baked bread, cereal, coffee, tea, fresh orange juice, and milk. Sample rates can be around $299 for mid-week, off-season in the Blossom Suite, while fall sees rates jump to $325 and up. A two-night minimum stay is required on weekends. 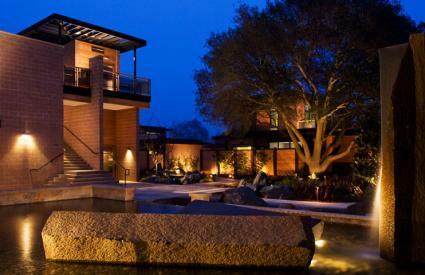 Located in St. Helena, Meadowood is one of Napa's high-end luxury resorts. It is owned by two Napa vintners (founding Partner H. William Harlan most notably of Harlan Estate and Stan Kroenke of Screaming Eagle) and is designed with the purpose of showcasing the best of Napa Valley's wine and people and to serve as a common ground for the vintner community. Meadowood is also a private country club for those looking to enjoy some rounds of golf. Other activities include tennis, croquet, hiking, swimming, and more. There are also on-site spa and fitness activities available. The list of amenities is notable at Meadowood - everything from the delivery of the morning paper to car service to Yountville and downtown St. Helena (based on availability). Rooms feature California king or queen-sized beds, fireplaces, down bedding, laptop-size safes, irons, coffee machines, Molton Brown bath amenities, robes and slippers, private outdoor terraces, and more. Dining at Meadowood is a treat in itself with a variety of options available, including a grill and Michelin three-star restaurant by chef Christopher Kostow. Not surprisingly, the resort has garnered a number of awards including the Wine Spectator Award, Travel+Leisure World's Best, and AAA 4-Diamond. The grill and restaurant are open to the public; all other amenities are exclusive to members and overnight guests. Sample rates at Meadowood start at $500 a night for a Lawnview Room to the Estate Suite at $2,150 a night. Part of the Hilton Brand of hotels, Embassy Suites is a great mid-range option in Napa Valley. The recently redesigned property has a Mediterranean vibe with fashionable furnishings and modern amenities. The 205 room all-suite hotel features a variety of lodging options, including pool view suites and classic atrium views. Look for Crabtree & Evelyn Bath amenities, complimentary hot breakfast, in-suite coffee, evening beverage reception and a galley kitchen with microwave, fridge and wet bar. Previous guests of the Embassy Suites have given it positive ratings for exceptional service, size of rooms, free parking, and beautiful grounds. Embassy Suites Napa Valley has two heated swimming pools, with the indoor one being open year round. Rent bikes from spring until fall, book an in-room massage, or get a workout in the fitness room, which features Precor equipment. Grille 29 is the restaurant at Embassy Suites. Here is where you'll find your complimentary cooked-to-order breakfast. Lunch and dinner are casual, with delicious options like Graham Zimmerman's open-fire grilled Angus burger. Want to enjoy dinner but prefer to not leave your suite? The entire menu can be ordered through in-suite dining. 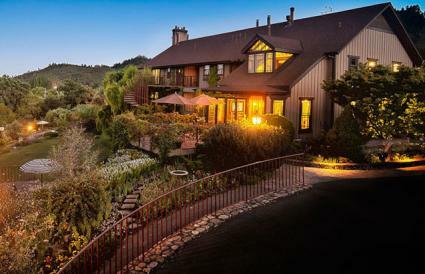 The intimate hillside Auberge du Soleil is part of the Relais & Chateaux portfolio of hotels and is one of Napa Valley's high-end luxury resorts. French-born restaurateur Claude Rouas recreated a Provencal style restaurant, which became the first fine-dining locale in Napa when it opened in 1981. The Inn opened just four years later and it remains a marriage of Provence and California's Wine Country. Today, the restaurant maintains its Michelin-star rating, making it a very sought after reservation in the valley. One of the main focus areas of Auberge du Soleil is wellness. Guests can enjoy world-class spa treatments in the Auberge Spa, which is modeled after a centuries-old monastery. Rooms at Auberge du Soleil range from standard garden and valley view rooms up to private villas that are 1,800 square feet each. All guest rooms, suites, and maisons have down bedding, Italian linens, custom-made bath amenities, plush robes, and private outdoor terraces. Rates start at $1,125 a night. The Meritage Resort and Spa is located just over four miles from downtown. It is a little further out than other resorts, but it's worth it - especially if you plan to visit Sonoma as well. The resort is located at the southern tip of the valley, where Napa and Sonoma meet. The Meritage Resort and Spa features the area's only spa in a wine cave, so it's perfect for a one-of-a-kind spa experience. You'll be surrounded by vines on the property here. The resort is also home to the Trinitas Cellars Tasting Room. The resort's 322 elegantly appointed guest rooms and nine suites are a bargain as compared to some other properties further up in Napa Valley. All rooms have 32-inch plasma TVs, large executive work desks, DVD/CD players, and more. There are 180 more studios and one-bedroom condos at the adjacent Vino Bello Resort. There are multiple dining options on site, including Siena Restaurant, which offers a menu inspired by the wine country. Head to Crush Ultra Lounge in the evening for cocktails and sports entertainment. Blend Cafe is where you can pick up pastries and coffee. Bardessono features 62 guestrooms in downtown Yountville, each designed with private in-room spa services in mind. The resort is quite mindful of its carbon footprint and environmental concerns. You'll find carbon fiber bicycles, on-site producing gardens, and other green living and operating practices, as Bardessono has committed itself to important environmental initiatives. It is one of the few LEED Certified hotels in the U.S.
Don't miss a meal at Lucy Restaurant & Bar, where all menus are inspired by seasonal local ingredients and the wine list showcases a number of small producers, organic, and biodynamic wines. Be sure to ask about tours in Lucy's Garden, located just steps from the kitchen. Room rates for Bardessono vary and may be found on the property's website. They offer a mid-week Spa Escape package that includes $200 spa credit per stay and a daily $50 food and beverage credit. 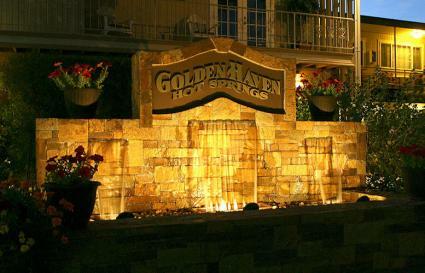 Head north to Calistoga and book a few nights at the Golden Haven Hot Springs Spa and Resort. Calistoga is at the northern end of the Napa Valley, an area blessed with natural hot springs. Golden Haven Hot Springs Spa and Resort offers mud bath experiences, including couples' packages for those looking for something romantic to do. If the idea of a mud bath seems a bit daunting, read some of the guest comments who felt the same, but loved the experience. Superior rooms at Golden Haven features a large bedroom and 12-foot vaulted ceilings. Four rooms have one bedroom and a king-sized bed. Some rooms even feature hot springs Jacuzzi tubs and two have saunas. Be sure to look online for last-minute deals and seasonal room and spa packages that start from $108 per person. Standard room rates begin at $150, Superior rooms at $175 for two people or $215 for up to four. Hot Spring Jacuzzi tub rooms begin at $195. Located in Calistoga, the Calistoga Inn is a clean and comfortable option for budget travelers. The 17 rooms are European style, which means private sink and queen size bed, but shower and toilet facilities are shared. Rooms don't have air conditioning, but they have ceiling fans. If you're adamant on a private bath, book the Cottage Unit #9, which is a single room studio with private bath. Calistoga Inn has no pool, but the Calistoga Community Pool is just blocks away. Tea, Coffee, and scones are provided daily and guests are given $5 vouchers that can go towards a hot breakfast at Johnny's, which is located nearby. The property has a great restaurant and craft brewery. The patio sits along the Napa River and the brewery is inside the historic water tower. This was the first place to legally brew beer again after prohibition and 100% of the brewery's production is served at the bar. Room rates start at $129 for Sunday through Thursday and $169 on weekends. The cottage starts at $189 Sunday through Thursday and $239 on weekends. 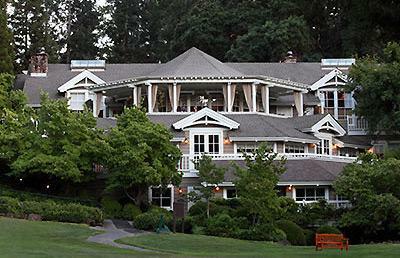 Set within the vineyards of St. Helena, consider Harvest Inn by Charlie Palmer. You'll find 78 luxurious accommodations split into five unique neighborhoods - The Manor, The Grove, The Vineyard, The Fountain, and Harvest Lofts. Look for high-end touches like in-room fireplaces, sunken tubs, and feather beds. If you're a fan of famous chefs, you picked up on the fact that Harvest Inn is indeed owned by Charlie Palmer. Harvest Table is Chef Palmer's Wine Country Kitchen featuring beautiful al fresco dining terraces and a 12-seat U-shaped bar that fronts the 110 seat restaurant. Guests receive discounted green fees during both peak and off season tee times. Don't miss taking a walk in the sculpture garden. Chef Palmer curated this 24-sculpture display. It features the work of local artist and is designed to recognize the synergy between art and nature. The Mountain King room start at $344 a night, while a manor vineyard suite starts at $589. Located in the heart of Napa Valley, St. Helena's Wine Country Inn has evolved from a small bed and breakfast to a romantic, antique-filled hotel. The hotel offers 29 rooms, suites, and cottages, each with air conditioning, free wi-fi, and amenities such as free parking and shuttle service. The hotel is situated on a knoll overlooking the vineyards, where you can relax and enjoy a picnic or glass of wine with scenic wine country views. The property offers a spa, year-round heated pool and hot tub, beautiful strolling gardens, and discounted access to a nearby fitness center. Rooms include Keurig coffee brewers, micro-fiber robes, and Tarocco bath products. There is a wine social with local wines and appetizers prepared by the chef or innkeeper between 4:30 and 6 p.m. every day. Rates start at $295 a night for a room and $910 a night for a cottage. 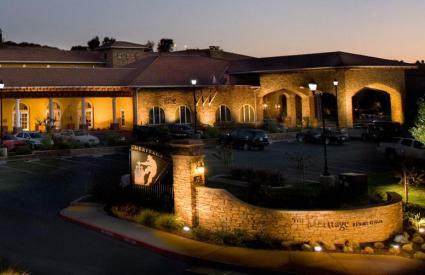 The Napa Valley Marriott Hotel & Spa is conveniently located just off Highway 29, near Robert Mondavi Winery. Choose from standard guest rooms, concierge lounge access, and concierge-level one-bedroom suites. The underwent a multi-million dollar redesign resulting in updated guest rooms, a brand new pool area, creation of a beautiful outdoor wedding site and more. Rooms at the Napa Valley Marriott feature pillow-top mattresses for a good night's sleep. Each room is equipped with flat-screen TV's, an ergonomic desk, coffee maker, iron, and ironing board. The hotel has an outdoor heated swimming pool and whirlpool, as well as a fitness center, sauna, and bike rentals. Rooms can be found for as low as $253 a night with Marriott a Rewards membership, which also includes free wi-fi. Note that a $20 amenity fee is added to the room rate. There are a wide variety of accommodation options in Napa Valley. While you won't find hostels all over the area, there are some moderately priced hotels around Napa as well as ultra-luxurious accommodations and everything in between. For those looking for the utmost splurge in Napa's Wine Country, you won't be disappointed!